A hub of tourism in the country's northwestern mountainous region, Sapa represents home for a large number of ethnic minorities from the hill tribes of the region, and acts as a base for explorations of the surrounding area's wealth of natural sights. Spend the 3rd (Thu) exploring nature at Hoang Lien National Park. There's lots more to do: appreciate the views at Muong Hoa Valley, take your sightseeing to a higher altitude at Fansipan Mountain, stop by Indigo Cat, and take in the dramatic scenery at Love Waterfall. Start your trip to Sapa by creating a personalized itinerary on Inspirock. Portland, USA to Sapa is an approximately 27-hour combination of flight and bus. You can also do a combination of train, bus, and flight; or do a combination of bus and flight. The time zone difference moving from Pacific Standard Time (PST) to Indochina Time (ICT) is 15 hours. Finish your sightseeing early on the 5th (Sat) so you can drive to Ninh Binh. On the 6th (Sun), browse the eclectic array of goods at Rong Market Ninh Binh, explore the fascinating underground world of Trang An Grottoes, and then make a trip to Bich Dong Pagoda. On the 7th (Mon), you'll have a packed day of sightseeing: identify plant and animal life at Van Long Nature Reserve, explore the fascinating underground world of Mua Caves, and then make a trip to Tam Coc. To find more things to do, ratings, traveler tips, and tourist information, read Ninh Binh road trip app . Traveling by car from Sapa to Ninh Binh takes 4.5 hours. Alternatively, you can do a combination of bus and train; or do a combination of car, flight, bus, and train. 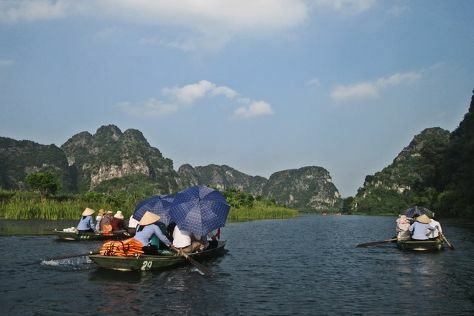 In January, daily temperatures in Ninh Binh can reach 68°F, while at night they dip to 58°F. Finish up your sightseeing early on the 7th (Mon) so you can go by car to Phong Nha-Ke Bang National Park. Phong Nha-Ke Bang National Park is known for nature, nightlife, wildlife, adventure, and spas. Your plan includes some of its best attractions: Head underground at Paradise Cave, explore the striking landscape of Phong Nha Caves, look for all kinds of wild species at The Duck Stop, and take in the dramatic scenery at Phong Nha Botanic Garden. For reviews and other tourist information, you can read our Phong Nha-Ke Bang National Park online travel planner . Getting from Ninh Binh to Phong Nha-Ke Bang National Park by car takes about 6 hours. Other options: do a combination of train, flight, taxi, and bus; or do a combination of train and taxi. Wrap up your sightseeing on the 10th (Thu) early enough to drive to Hue. Hue is known for historic sites, nature, spas, nightlife, and shopping. 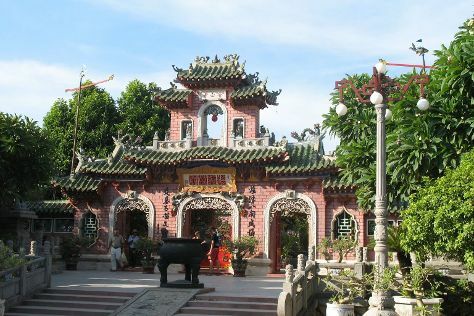 Your plan includes some of its best attractions: contemplate the long history of Imperial City, stroll through Thuan An Beach, contemplate in the serene atmosphere at Thien Mu Pagoda, and make a trip to The Flag Tower. To see where to stay, other places to visit, ratings, and more tourist information, read Hue trip itinerary builder . Getting from Phong Nha-Ke Bang National Park to Hue by car takes about 3 hours. Other options: take a bus; or do a combination of taxi and train. January in Hue sees daily highs of 74°F and lows of 64°F at night. Finish your sightseeing early on the 15th (Tue) so you can drive to Hoi An. Explore Hoi An's surroundings by going to Mỹ Sơn (in Duy Xuyen) and Da Nang Museum of Cham Sculpture (in Da Nang). Spend the 18th (Fri) on the water with a fishing tour. Make the 20th (Sun) an unforgettable day with an extreme tour. There's much more to do: make a trip to Hoi An Ancient Town, tour the pleasant surroundings at An Bang Beach, take in the dramatic natural features at The Marble Mountains, and take in the views from Japanese Covered Bridge. To find traveler tips, where to stay, maps, and tourist information, read Hoi An sightseeing planning site . Traveling by car from Hue to Hoi An takes 2 hours. Alternatively, you can do a combination of train and taxi; or take a bus. In January in Hoi An, expect temperatures between 77°F during the day and 67°F at night. Finish your sightseeing early on the 22nd (Tue) to allow enough time to travel to Nha Trang. 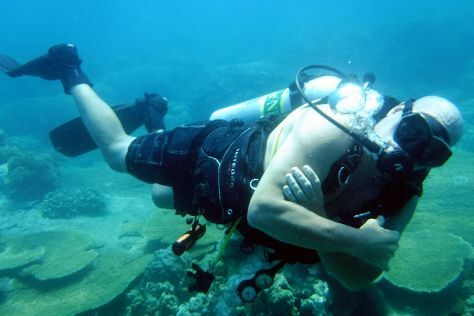 On the 24th (Thu), spend a cool day on the water with Mark Scott's Diving Vietnam. There's much more to do: make a splash at Vinpearl Land Amusement Park, take in the views from Xom Bong Bridge, see the interesting displays at Alexandre Yersin Museum, and enjoy the sand and surf at Long Beach. To find more things to do, traveler tips, and tourist information, go to the Nha Trang holiday site . Do a combination of taxi, flight, and shuttle from Hoi An to Nha Trang in 3 hours. Alternatively, you can do a combination of taxi, flight, and bus; or drive. Finish your sightseeing early on the 26th (Sat) to allow enough time to drive to Phan Thiet. Phan Thiet is known for wildlife, nature, adventure, spas, and beaches. Your plan includes some of its best attractions: enjoy the sand and surf at Mui Ne Beach, putt your heart out at Tropical Mini-Golf, don't miss a visit to White Sand Dunes, and choose your vessel at MANTA Sail Training Centre. To see traveler tips, more things to do, photos, and tourist information, read our Phan Thiet trip planner . You can drive from Nha Trang to Phan Thiet in 3.5 hours. Other options are to take a train; or take a bus. Finish your sightseeing early on the 30th (Wed) to allow enough time to drive to Da Lat. Da Lat is known for nature, historic sites, parks, shopping, and nightlife. Your plan includes some of its best attractions: scramble along the landscape with a canyoning and rapelling tour, browse the eclectic array of goods at Dalat Market, take in the spiritual surroundings of Linh Phuoc Pagoda, and contemplate the waterfront views at Xuan Huong Lake. For ratings, photos, reviews, and tourist information, you can read our Da Lat trip itinerary planning tool . Getting from Phan Thiet to Da Lat by car takes about 3 hours. Other options: take a bus. Finish your sightseeing early on the 5th (Tue) so you can travel to Ho Chi Minh City. Ho Chi Minh City is known for museums, nightlife, shopping, spas, and historic sites. Your plan includes some of its best attractions: make a trip to Cu Chi Tunnels, hunt for treasures at Ben Thanh Market, ponder the world of politics at The Independence Palace, and let your taste buds guide you at a local gastronomic tour. For reviews, more things to do, and other tourist information, go to the Ho Chi Minh City trip planner . Traveling by combination of taxi and flight from Da Lat to Ho Chi Minh City takes 1.5 hours. Alternatively, you can drive; or do a combination of taxi and train. In February, daytime highs in Ho Chi Minh City are 92°F, while nighttime lows are 73°F. Finish your sightseeing early on the 12th (Tue) to allow enough time to travel to Phu Quoc Island. Phu Quoc Island is known for beaches, historic sites, adventure, nature, and spas. Your plan includes some of its best attractions: relax in the rural setting at Phu Quoc Countryside, make a trip to Dinh Cau Rock (Cua Temple), tour the pleasant surroundings at Long Beach, and stop by The Green Boutique. To see other places to visit, ratings, reviews, and more tourist information, refer to the Phu Quoc Island road trip planning app . Getting from Ho Chi Minh City to Phu Quoc Island by flight takes about 1.5 hours. Other options: do a combination of bus and ferry; or take a bus. 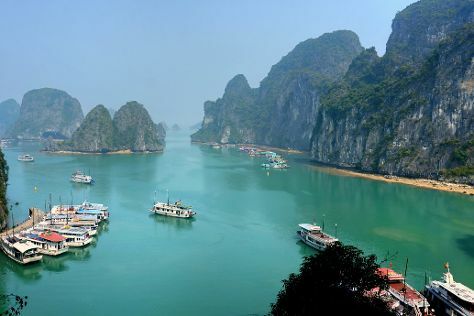 Wrap up your sightseeing on the 16th (Sat) early enough to travel to Halong Bay. When in Halong Bay, make a side trip to see Cat Ba National Park in Hai Phong, approximately 50 minutes away. There's still lots to do: contemplate the waterfront views at Hạ Long Bay, Head underground at Dau Go Cave, contemplate in the serene atmosphere at Long Tien Pagoda, and head off the coast to Hon Ga Choi Island. For ratings, maps, other places to visit, and other tourist information, use the Halong Bay trip planner . You can do a combination of flight and bus from Phu Quoc Island to Halong Bay in 5 hours. Finish up your sightseeing early on the 19th (Tue) so you can travel to Cat Ba. The largest of the islands in the south of the bay, Cat Ba offers a base for exploring the many limestone landmasses across the UNESCO-protected bay. Spend the 21st (Thu) exploring nature at Cat Ba Island. There's much more to do: see some colorful creatures with Full Moon Party Tour, make a trip to Cannon Fort, enjoy the sand and surf at Cat Co 1 Beach, and explore the activities along Lan Ha Bay. For other places to visit, more things to do, maps, and tourist information, read our Cat Ba online journey planner . Getting from Halong Bay to Cat Ba by ferry takes about 4 hours. Finish your sightseeing early on the 22nd (Fri) to allow enough time to travel to Hanoi. Pamper yourself for a day on the 27th (Wed) at some of the top local wellness centers. On the 28th (Thu), spend an adventurous day with a kayaking and canoeing tour. There's lots more to do: get to know the fascinating history of Old Quarter, let your taste buds guide you at a local gastronomic tour, explore the activities along West Lake, and get engrossed in the history at Ho Chi Minh Museum. For more things to do, ratings, photos, and other tourist information, use the Hanoi trip planner . You can take a bus from Cat Ba to Hanoi in 4 hours. Another option is to do a combination of ferry and train. Cap off your sightseeing on the 1st (Fri) early enough to travel back home.